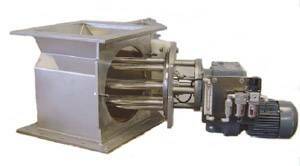 Stationary magnetic grates can have a tendency to clog and bridge in many applications, so to overcome this problem, Nu-Con has introduced the Demountable Rotary Magnet, which is a sanitary and economic method of removing ferrous particles from product, with the additional benefit that the rotating action also tends to break up lumps and cohesive materials. 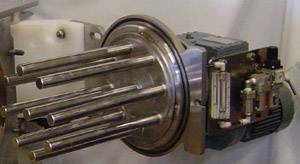 The unit rotates a number of powerful magnetic tubes while the product passes through. The magnetic action attracts and holds the unwanted ferrous particles, and the rotary action prevents the product from packing the process stream by breaking apart lumps and cohesive materials. With Nu-Con’s Easy-Slide rotor support, the magnetic rotor is easily demountable from the housing without tools and the rare earth cartridges used in the unit provide maximum cleaning efficiency. 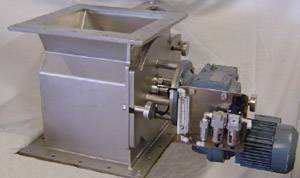 With direct drive, air purged shaft seals and the option of ANSI flanges, the Nu-Con Demountable Rotary Magnet is ideal for removing ferrous particles from a product stream in applications where a static grate magnet would cause a restricion in flow.